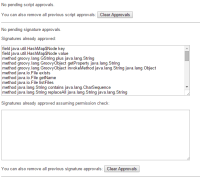 Larger installations may have a lot of approved signatures and the current UI only allows one to clear all signatures with a "Clear Approvals" button (see screen shot below). It would be nice if the UI would allow one to clear individual signatures. A base example would be if the user accidentally approved System.exit but does not want that to run! This seems like a matter of reversing the way things are hashed in the below code and adding it as a new function that is called by a button from the UI? Probably the button to clear everything should be removed, the textarea should be made into a multiselect list control, and there should be a button to remove selected items. Or with a little more work we could have a fancier UI with a little × button next to each item. Jesse Glick added a comment - 2015-11-02 15:14 Probably the button to clear everything should be removed, the textarea should be made into a multiselect list control, and there should be a button to remove selected items. Or with a little more work we could have a fancier UI with a little × button next to each item.